This is the John Rutledge House Inn classic She-Crab Soup Recipe, as it was submitted to a Historic Hotels of America cookbook in the early 1990’s. In Charleston, you’ll see She-Crab Soup on many restaurant menus, but the very first bowl was whipped up here at the Rutledge House. 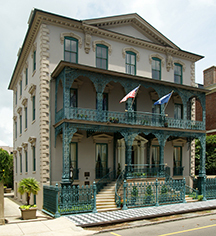 In the 1920s, Charleston’s mayor Robert Goodwyn Rhett resided here at 116 Broad Street. Mayor Rhett was expecting a visit from President William Taft during his tour of Charleston. Wanting to do something special for the President, Mayor Rhett asked his butler, William Deas, to “dress up” their typical crab soup. His presidential variation featured orange crab eggs, giving the soup bright color and great taste. Thus began a legacy and practical rite of passage for Charleston foodies. As this recipe (which has been slightly altered since its original) notes, She-Crabs (aka roe-carrying female crabs) are known to be real delicacy because they have much more taste than their male counterpart, He-Crabs. The orange-hued eggs of she-crabs give the soup extra flavor and color. She-crabs are difficult to find in many parts of the country, so white crab meat can be substituted. Hard boiled egg yolk may be crumbled in the soup to imitate crab egg. Heat butter in large sauce pan. Add celery, mace and white pepper. Cook over low heat until celery is almost transparent. While celery is cooking, heat milk and chicken stock in small pan just enough to make milk hot without boiling. When celery mix is done, add flour to make a roux. Do not brown but heat enough to bubble for several minutes. Slowly add milk and chicken stock to roux, add salt for taste. Add crab meat, heavy cream, Worcestershire, and sherry. Simmer for 30 minutes or until thickened to appropriate consistency. For a garnish boil 2 eggs. Take the yolk out and grate. Sprinkle over the tops with paprika. 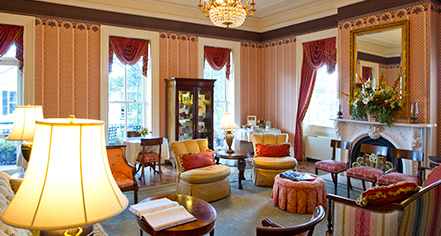 Come fall, you can enjoy a bowl of She-Crab Soup at the Rutledge House just as President Taft did. We’ll open up our beautiful, historic Signer’s Ballroom for a formal tea party on November 16th, where Mr. Deas’ She-Crab Soup will be served alongside English-inspired tea items. You can make it a weekend affair with our Steeping in History Package, or just join us for the afternoon! Get the full details and join our 250th anniversary celebration.